Join us for the next in F5’s series of bike jaunts through Shanghai, stopping at conveniences stores for a cheeky beer and rolling on full of Irish merriment. If you’ve been on one before you’ll know they’re awesome. If you haven’t; they’re awesome. We start 2pm at Factory Five (876 Jiangsu Lu) and will ride until sundown or so. 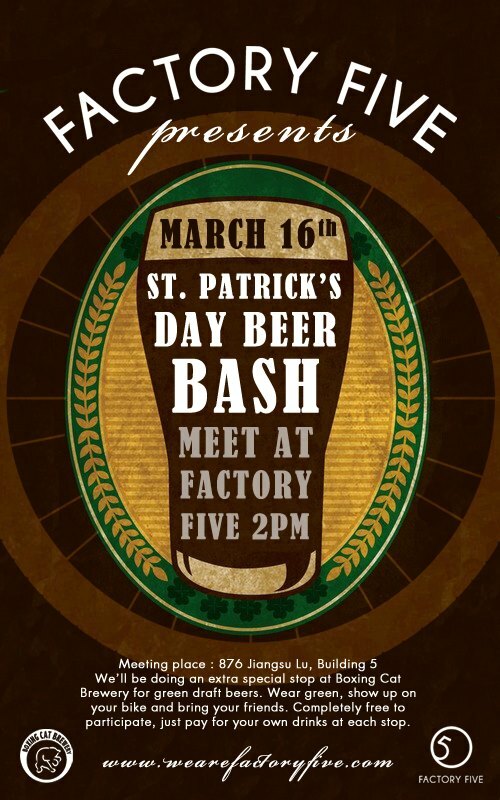 This year the Boxing Cat have kindly offered to put a green-beer pump streetside so we’ll be stopping there for a cheap drink… as well as a basically random string of convenience stores at which we’ll be pausing for drinks and music and mirth. Bring your bike, some pocket change and smiley faces. All are welcome regardless of what you ride as long as you’re in full control and it’s self-propelled. We love helmets; safety never takes a holiday so bring it along too. All photos are licensed under Creative Commons Attribution-ShareAlike 4.0 International license, except where otherwise noted and/or sourced.